want to know what it is and how it is used. Coverage: All U.S. including Hawaii and Alaska. These ArcGIS shapefiles work with the free ArcExplorer GIS viewer, ArcView GIS, ArcGIS, Maptitude, Mapinfo, Manifold, TatukGIS and many other commercial GIS and mapping programs and many free GIS programs as well. Each layer includes easy to follow instructions that show you how to add streets, highways, census information and much more to your maps for free. We have included national level base maps with each map archive listed below. Also, check our free GIS software and free GIS ArcGIS shapefiles pages for more information and free ArcGIS shapefiles. Each shapefile map layer is $97 or you can purchase them all for $497 saving a considerable amount. Click next to the map you wish and you will have immediate access to it using our secure merchant account provider, ClickBank. Important! Please note that your credit card or bank statement will show a payment to ClickBank or CLKBANK*COM. Purchase all Indian and Federal Lands shapefiles listed for $497. Download Now. Download Indian Lands (BIA) Shapefile. 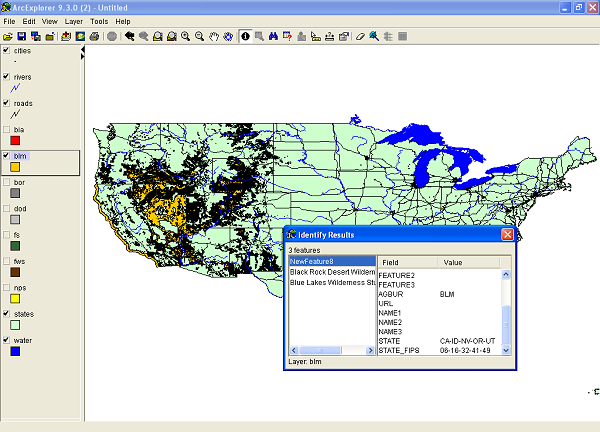 Download Bureau of Land Management (BLM) Shapefile. Download Bureau of Reclamation (BOR) Shapefile. 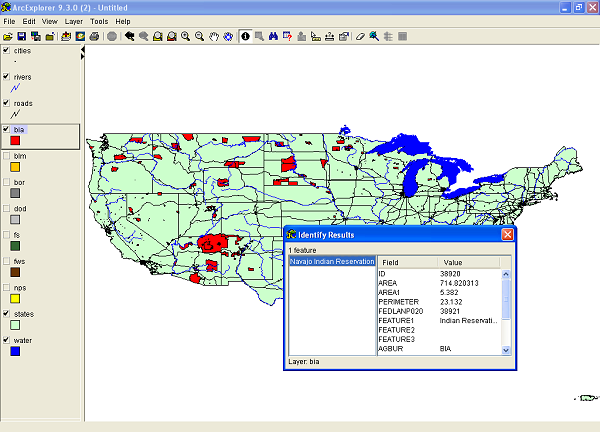 Download Department of Defense (DOD) Shapefile. 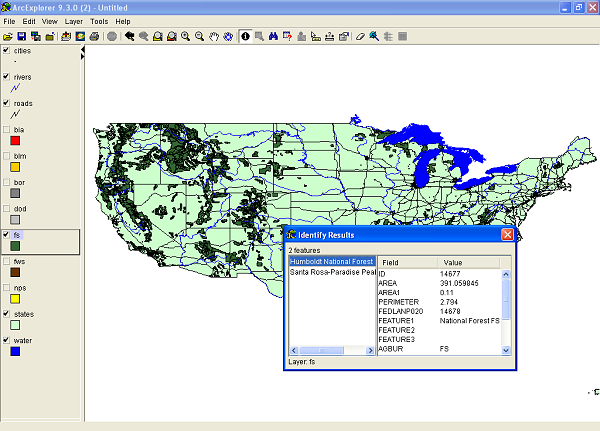 Download U.S. Forest Service (USFS) Shapefile. 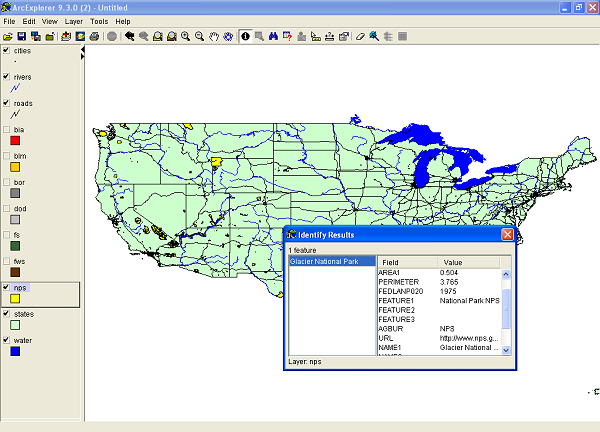 Download Fish and Wildlife Service (FWS) Shapefile. Download National Park Service (NPS) Shapefile. Each map layer was created by extracting federal land polygon features from the individual 1:2,000,000-scale State boundary Digital Line Graph (DLG) files produced by the U.S. Geological Survey. These files were then appended into a single coverage. Individual layers (above) were extracted from this coverage. (Source: USGS). This data may come from a variety of U.S. government, non-governmental and self-reporting private sources. While we try to assure the accuracy of this material, we cannot promise that it is absolutely accurate. We do promise that using the map layer will be fun, entertaining or educational. Beyond this, we make no guarantee as to its suitability for any purpose. We assume no liability or responsibility for errors or inaccuracies. Please understand that you use these map layers and data at your own risk.